The soup parade continues! I’ve kept up with my New Year’s resolution of making a new pot of soup every week, and up until now they’ve all been fairly healthy varieties – Chicken Noodle Soup, New England Clam Chowder, and Minestrone. So you had to figure that it was only a matter of time before I laid something a little heavier at your feet. For the most part, I have gotten away from eating very heavy or cream-laden soups since much of the beauty I find in eating soup is that it’s a pretty light meal and doesn’t leave you feeling weighed down. That being said, sometimes a bowl of creamy decadence can be just what the doctor ordered, especially during a cold and blustery day in the winter. 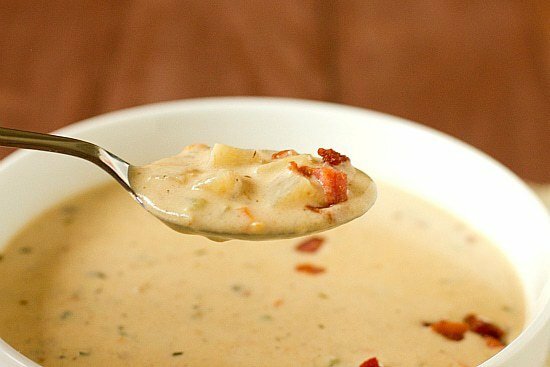 And this creamy potato cheese soup will certainly fit the bill. I’ve been wanting to try a creamy potato soup for seemingly ever, and finally went about a search with my first stop being my favorite soup resource, the The Best Soups and Stews, which is written by the editors of Cook’s Illustrated magazine. 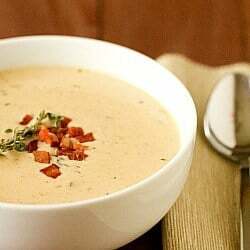 They had a basic cheddar cheese soup in the book, with a couple of different variations – one that included bacon and another that included potato and beer. It’s no secret that I’m a carbaholic (hello, potatoes! 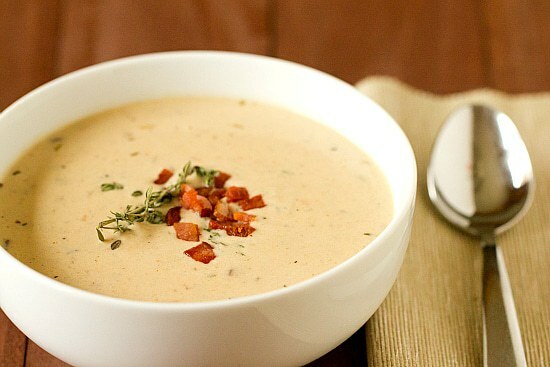 ), that bacon makes everything better, and that beer in food is usually always awesome, so I went about combining each of the elements I liked from all of the variations into one utterly amazing soup. This soup is definitely best as soon as you make it, but I feasted on leftovers for a couple of days. Due to the cheese and dairy in the soup it can separate a little and become slightly grainy when you re-heat it, but don’t worry, it still tastes fabulous, it just doesn’t look as pretty. I love all the flavors going on here and how chunky the soup is. This recipe is definitely going to be stashed away for many chilly days to come! Fry the bacon in a large stockpot or Dutch oven over medium-high heat until crisp, 5 to 10 minutes. With a slotted spoon, transfer the bacon to a paper towel-lined plate and set aside. Add the onion and shallot to the pot containing the bacon drippings and cook, stirring occasionally, until softened, about 4 minutes. Add the potato, carrot, celery, and garlic and cook until the garlic is fragrant, about 1 minute. Add the flour and cook, stirring to coat the vegetables, until the mixture begins to brown on the bottom of the pot, about 2 minutes. Gradually whisk in the ale, chicken stock, and half-and-half. Add the bay leaf and increase the heat to medium-high. Bring to a boil, reduce the heat to medium-low, and simmer until the vegetables soften, about 3 minutes. Remove the pot from the heat. Stir in the cayenne and sherry and allow to cool slightly, about 2 minutes. Slowly whisk in the cheese and thyme until the cheese melts. Stir in the fried bacon, season with salt and pepper to taste, and serve immediately. 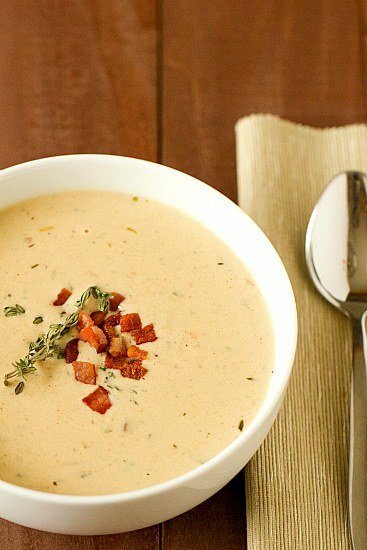 I have made this recipe several times now, it has definitely become my favorite soup to make! Stays good in the fridge, I always end up eating all the leftovers over the next few days which is rare for me. what is half and half, please? Hi Lynn, It’s a common product sold in grocery stores in the U.S.; it’s essentially one part whole milk, one part heavy cream. I made this soup tonight and LOVE IT! I didn’t have any sherry, so had to do without that, but it turned out great regardless. I pureed half the soup after the potato and veggies were cooked to thicken the texture, and it worked really well. So full of flavour! 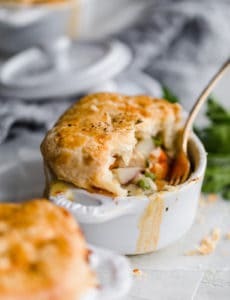 Hi Michelle, we really love this recipe and want to feature it in a slideshow as one of the Ten Best Cheese Dishes Ever. I’ve sent you an email with the details. Please tell me this is possible. Cheers! This soup is delicious! I ended up using pancetta instead of bacon, so I had to add unsalted butter to saute the the veggies. I used Cougar Gold cheese and Newcastle Brown Ale. I also served it with popcorn on top Midwestern-style. I reheated it for lunch today and was thrilled that this soup maintained its texture (and the taste was even better than last night)! I had the same question as Mark re: the simmer time (3 mins seemed like too little). I just kept simmering it at medium low until I was happy with the potatoes.